The first poem in Boston Dialect: Volume One, Ashes Lent, gives a hint at a religious, or at least deep-thinking man in Paul Tait. According to the introduction, none of the poems had titles originally; they were an expression of his on-going thoughts. The titles are intriguing, and the sheer number of poems – more than in any poetry book I have read before – gives a clue as to how much they vary and, to a degree, reflect a fascinating life. But this is more than a life story, or part of one, of a musician – singer, pianist, band leader, and composer - because Paul Tait delves deep into his psyche, and his poetry is powerful due to that. Join him and be enriched by the experience. Boston Dialect: Volume One is a book that left me wanting to read Volume Two: the sign of a very good book whatever the genre. I confess to a love of freestyle poetry – words unhampered by the need for rhyme or verses - and these flow one into the next like a river running to the sea, sometimes fast with floodwater and at others peaceful. It’s impossible not to choose favourites and these were mine. I Know as Much as I Do: We are the Children of Promiscuous Sin, Art Net Confines – who could resist “The gain and the cost The chain and the frost I can tabulate”? – and I Thought I Knew the Way Back to God. Paul Tait’s Boston Dialect is inspirational; to read his poetry is to pass through a gateway into another world. In Boston Dialect: Volume I, a book of poems by the singer and songwriter Paul Tait, each work delves into the author's creative thought process. In a frank prose that is in some ways darker in tone than his previous work, Tait still manages to invite the reader with him on a journey of self discovery, with a certain grasp on lyricism that demands each page be read aloud even as he dives into topics like suicide, and love captured and lost. As with his previous book, Seven Centers, Tait continues to evoke a feeling of song lyrics, drawing the reader in with how the words are arranged and the cadences employed. His talent as a poet grows stronger with each work. Tait hops between a few different topics in Boston Dialect and while these are filled with more of a dark vein, he seems to build up the theme of Boston well. As always, Tait uses a minimalist approach, one that manages to capture the essence of his thoughts and convey them to the reader without weighing them down in a torrent of florid prose. 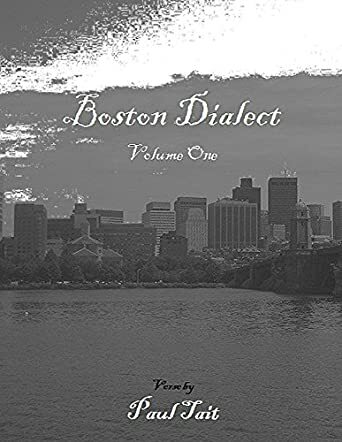 In Boston Dialect: Volume I, as with his previous work, Paul Tait has managed to create a simple collection that is sure to sit with the reader long after they have finished the last page. I enjoyed every passage and feel that Boston Dialect by Paul Tait should be a great read for fans of poetry as it illustrates the creative mind and stirs the senses. Boston Dialect: Volume One is as inspiring as it is deeply moving and the poet gives voice to some of the indescribable sentiments that visit the human spirit, at times in the hushed hours of the day, like the dream one has and doesn’t want to wake up from, like a new discovery of a reality that has been there before one’s eyes, veiled by the banality of life. The diction is beautiful and the lines of these poems are rhythmic. One of the greatest appeals of this collection lies in the simplicity of phrase and the sharpness of thought. A really enjoyable read, indeed.